American Assassin by Vince Flynn: Synopsis and Online Purchase Options. 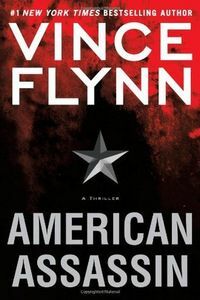 Synopsis (from the publisher): Before he was considered a CIA superagent, before he was thought of as a terrorist's worst nightmare, and before he was both loathed and admired by the politicians on Capitol Hill, Mitch Rapp was a gifted college athlete without a care in the world … and then tragedy struck. Two decades of cutthroat, partisan politics has left the CIA and the country in an increasingly vulnerable position. Cold War veteran and CIA Operations Director Thomas Stansfield knows he must prepare his people for the next war. The rise of Islamic terrorism is coming, and it needs to be met abroad before it reaches America's shores. Stansfield directs his protege, Irene Kennedy, and his old Cold War colleague, Stan Hurley, to form a new group of clandestine operatives who will work outside the normal chain of command—men who do not exist.